Personal items belonging to a World War One lieutenant, discovered at a school in Hertfordshire, have been described by experts as a "unique find". The trunk, which includes a uniform bearing the ribbons for the Military Cross, was found at Highfield School in Letchworth. It is not clear how the chest, the property of Lt Howard Hands, found its way into the school. Herts at War historian, Dan Hill, said opening the trunk was a "wow moment". 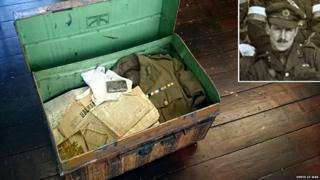 As well as containing Lt Hands' immaculate uniform including his cap, belts and cigarette case, maps showing a network of secret tunnels that ran under enemy positions on the Western Front, photographs, newspapers and his bedpan were also in the trunk. The Herts at War project sprang out of a series of individual historical research assignments and collaboration with Letchworth's Highfield School History Department, to uncover the wartime exploits of local soldiers in the Great War. Mr Hill said the trunk was probably given to the school by one of Lt Hands' grandchildren but "it is all a bit of a mystery". Mr Hill said opening the trunk had been a "fascinating experience". "The quality and near perfect condition of the items were like time had stood still. It is poignant to know he was a local man, somebody who walked the same streets and places in Hertfordshire as we do." Mr Hill said the newspapers, which Lt Hands collected from the various places he was posted to, are still readable. "We can pretty much follow him through his postings." Mr Hill said the overall collection was "something quite special". "The content had actually been overwhelming," he added. "He was clearly a brave soldier, he was given the Military Cross and to know what he was carrying and using on a daily basis is perhaps the most interesting things about the entire case." The trunk is the focus of a history project at the school and is currently on display at the Herts at War exhibition.